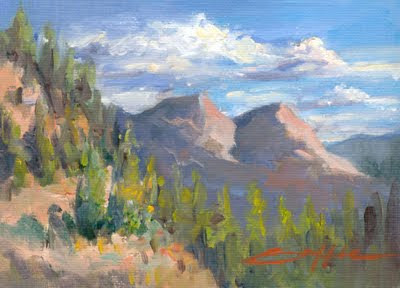 "Above the Tree Tops" 5" x 7"
"Close to Heaven" 5" x 7"
Here are a couple more paintings from my recent trip to Colorado. These are much smaller than most of my paintings. I tried this smaller size out for two reasons. First, I knew I would be painting fast so I wouldn't be forcing my family to sit around while I worked. Second, because of the ease of finding a frame. 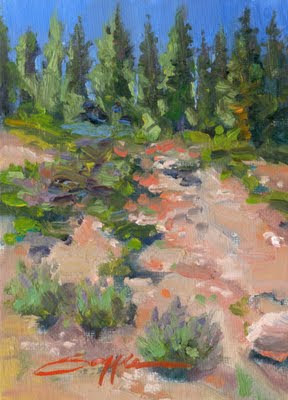 Colorado plein air was a fun challenge. I have experience painting outdoors with fast moving shadows changing my view, but I found out in Colorado entire mountains change value and color temperature within moments. Clouds pass overhead and cover very large areas. It was hard not to chase the ever changing views, but "wow" was the beauty worth the attempt. These small paintings and the thousand or so photos I took will keep me inspired for some time. What beautiful reminders of a wonderful family vacation. I love how you captured the grandness of the mountain scenery in such a small scale. Thank you for taking us along on your most excellent adventure. Looking forward to the next roadtrip.